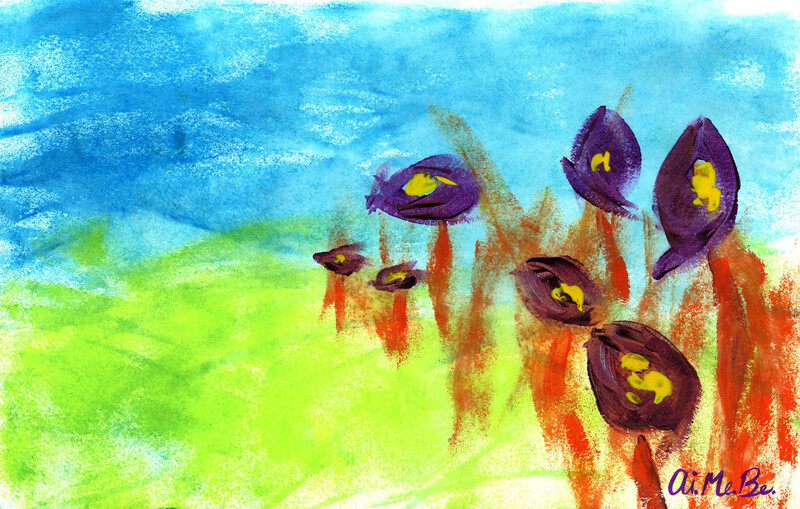 Fleeting Field of Purple Pods | Ai.Me.Be. My friend Sarah reminded me of a horseback ride we once went on as kids. We were trailblazing (which usually includes dodging/getting hit with lots of branches and always adds a level of excitement to a ride) somewhere in the miles between our two houses. We stumbled upon the most beautiful field of purple flowers. We never were able to find this field again, though we did try, or at least there were no purple flowers. It kinda reminds me of the time I came across an amazing sandy beach with my cousin Dave, which we also never found again.. He must have told the nieces about it cause they asked me to take them to the sandy beach over the summer. We looked for it to no avail, but found some good stepping stones in the creek instead. Perhaps it’s true that you can never go back…but a scene or experience or emotion, etc can be visited again…as here…through the poet’s pen and the artist’s brush.